We recently sat down with Liz Wong, Author of Quackers, to ask some questions about her book and what it means to be a part of Read for the Record. Liz was born in Honolulu, Hawaii, where she spent her early childhood painting and clambering about in mango trees. Winning the first place trophy in her elementary school poster contest encouraged her to pursue art instead of a sensible career in finance like the rest of her family. 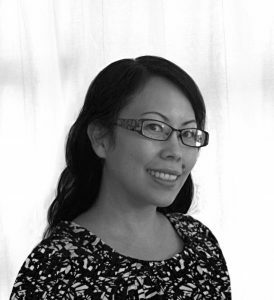 Liz holds a BFA in Art and a BA in Anthropology from the University of Washington and currently resides in Edmonds, Washington with her husband and son. She continues to alternately delight and exasperate her family to this day. The Read for the Record campaign was created to highlight the importance of early literacy, and inspire a love of reading from an early age. Did you like to read as a child? What was your favorite book? I loved reading as a child. My mother is an avid reader, so we spent a lot of time at the library and the local bookstore. She also took us to the Friends of the Library book sales, and I fondly remember digging through boxes of books and finding some treasures. I still have some of them. My sister and I would play library as well; we even made book checkout cards for our books at home (back in those days, the librarian would stamp the due date on a little card inside the book). We were really, really into books. One of my favorite books was a picture book version of a Japanese folktale, Urashima Taro, often described as the “Japanese Rip Van Winkle.” It is about a young fisherman who saves a sea turtle and is rewarded for his kindness with a journey to the underwater kingdom of the sea princess. He comes back to land and finds out hundreds of years have passed while he was underwater. While the ending is a bit tragic, the thing I loved about that book is the illustrations of the underwater scenes, and I spent hours poring over them. I’ve always loved stories where there is a hidden magical world just beyond this one, and every time I opened that book, it was like I was accessing that magical world. We know that reading aloud with young children helps bring the story to life an increases understanding. What is a favorite book you read with your son? There are so many, it’s hard to choose one. Beegu by Alexis Deacon is one of my favorite picture books. It’s about a little alien who gets lost and is trying to find his family. The illustrations and the story are sweet and touching and the text is beautifully spare. The way the pictures and the text work together is spot on, and it holds up to multiple readings. But, oh, I could provide a whole list of books that I love! You’ve been an illustrator for children’s books for a long time, what made you decide to write your own book? For years I considered myself strictly an illustrator. I loved drawing, but writing never came easily to me. But when you’re involved with children’s illustration, you spend a lot of time studying books and trying to create a story within each individual illustration. Eventually you start to have story ideas, too. Honestly, I realized it was going to be much easier to get published if I just wrote my own story, instead of hoping that a story that fit my illustration style would land on an editor’s desk and that editor would match me up with that story. Admittedly, it took years between having the idea for Quackers and actually figuring out how to write it. Writing is still considerably harder than illustrating for me, but I finally started identifying myself as an author/illustrator instead of “an illustrator who happened to write a book,” so that’s a step in the right direction. Did you always love reading and drawing? Yes, most definitely. I was the kid who was always drawing and by first grade I decided I wanted to be an artist when I grew up. I always thought I would be a sculptor, though, and I ended up majoring in ceramics in college. Eventually I stumbled upon a class for children’s illustration and I realized that’s what I wanted to do. I couldn’t believe I hadn’t thought of it before, since I had a deep and enduring love for children’s books. I was one of those adults who never stopped reading books for kids, but for some reason, never thought about who made those books or where they came from. My favorite part is putting the paintbrush to paper. There is something so satisfying about watching the color spread across the paper. You get lost in it. I’m always surprised by how much I enjoy painting. That being said, it is really easy to mess up, so I use a combination of watercolor and digital. Knowing that I can go back and fix my mistakes takes a little bit of the pressure off the painting process, so the actual painting process is just pure fun. What is Quackers about, and what inspired you to write the story? Quackers is about a cat who thinks he is a duck. Quackers is also about finding your place in the world, learning it’s okay to be different, and that what you look like on the outside and what you’re like on the inside don’t always match. I started out writing Quackers because I drew a picture of a cat and thought it would be funny if the text said that it was a duck. From there I started thinking of what life would be like for a cat who lived at the duck pond and what would happen if he found out he wasn’t a duck after all. When I was coming up with the ending, I thought at first that Quackers would realize he’s a cat, live with the cats and visit the ducks occasionally, but that ending was profoundly unsatisfying. Then I started thinking about my own background, being half Asian and half white, and feeling like I didn’t really fit in anywhere either. I realized that, like me, he didn’t need to choose. He could be both a cat a duck. That simply is who he is. What does it mean for you to have Quackers be this year’s official Read for the Record book? When you have a book published, you aren’t really sure if anyone other than your mom is going to read it. To think that more than 2 million people are going to read it… it’s astonishing. I feel incredibly fortunate that my book was chosen, out of all the other books that came out last year. I was in New York meeting my editor when she told me Quackers had been chosen as the Read for the Record book, and that night I went back to my hotel room, called my family and burst into tears, I was so overwhelmed and happy. I am so thankful to be a part of this extraordinary event and this mission. I wrote a funny story about cats and ducks, so this may sound a bit grandiose, but if I can in any small way tell these kids that they matter, that they are full of wonderful stories and they have the power to tell them, that when they pick up a book they bring their own meaning to those words and that in itself is powerful and important, then I feel like I’ve done something worthwhile. One of the great surprises of being a published author/illustrator is how much I enjoy connecting with kids. I love going to schools and seeing how excited kids are and how much they want to participate. 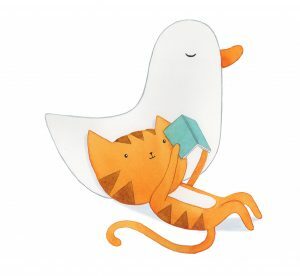 I wrote a funny story about cats and ducks, so this may sound a bit grandiose, but if I can in any small way tell these kids that they matter, that they are full of wonderful stories and they have the power to tell them, that when they pick up a book they bring their own meaning to those words and that in itself is powerful and important, then I feel like I’ve done something worthwhile. 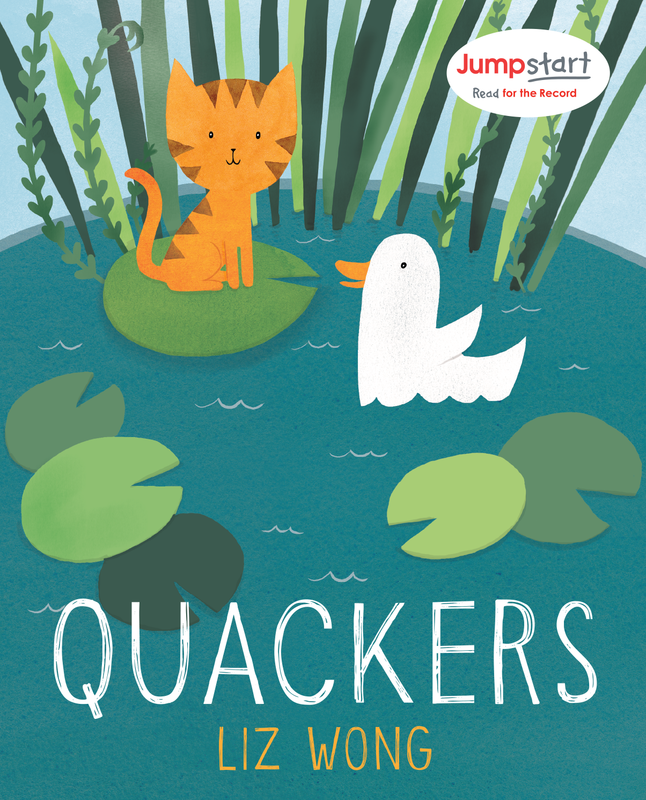 Quackers, by Liz Wong is the official book selection for Jumpstart’s Read for the Record, taking place on October 19, 2017. Click here to learn more.